Boston has now won back-to-back games for the first time since January 10 and 12. (Photo Credit: Star-Telegram). Happy Friday to everyone, and welcome into another grand-slam edition of the Daily Noontime! We’ve got some news, updates and headlines, so let’s get rolling! * The Boston Bruins earned their 40th win of the season on Thursday when they defeated the Buffalo Sabres, 3-1. Gregory Campbell, Johnny Boychuk and David Krejci all scored goals, while Tim Thomas deflected 19 shots. The Bruins have now won back-to-back games for the first time since January, and will return to the ice on Saturday when they host the Washington Capitals at 1:00pm. * The Boston Celtics will look to snap their one-game skid on Friday when they host the Portland Trailblazers at 7:30pm. The Green and White are currently clinging to the seventh spot in the Eastern Conference, and would probably play against Chicago or Miami in the playoffs. However, there is still a decent amount of time remaining before the tournament begins, right? * According to reports – former Boston Celtics guard-forward Gerald Green inked his name on a 10-day contract with the New Jersey Nets on Thursday. * The Boston College Eagles men’s basketball team didn’t exactly recover from a slow start on Thursday during their first ACC tournament game, as North Carolina State handed them a 78-57 loss. * Finally, the Providence College men’s ice hockey team shocked University of Massachusetts (Lowell) on Thursday in Game 1 of the Hockey East quarterfinals, 5-3. It’s Friday, and before we break into song and dance, let’s dish out some headlines news from the sports universe… Boston, Massachusetts! * David Krejci notched three goals against New Jersey on Thursday, which included the game-winner in OT, as the Bruins defeated the Devils at the TD Garden, 4-3. Boston hasn’t swept New Jersey in the regular season since 1985-86. Boston will return to the ice on Saturday when they host the New York Islanders for a 1:00pm face-off. * According to various Boston sources – Boston Celtics team president Danny Ainge isn’t planning on shopping or trading Rajon Rondo. Although, ESPN’s Chris Broussard did report that the organization is “aggressively shopping” their point guard. The NBA trade deadline is rapidly approaching, March 15, and it’s certainly possible that the Celtics could trade their valuable puzzle piece. * The Boston Celtics will return to the hardwood on Friday when they host the New Jersey Nets for a 7:30pm tip-off. BOSTON, MA – Trailing Carolina by one goal, Boston’s goaltender Tuukka Rask, (20 saves) attempted to jumpstart his team’s offense by recording various highlight reel saves. Yet, Rask’s efforts didn’t exactly help, as the Hurricanes took advantage of Boston’s lackluster player to notch their second goal of the evening, which Tuomo Ruutu connected on a backhanded rebound for the score at 16:41. The Hurricanes tallied 14 shots in 20 minutes while the Bruins finished the period with five. Boston had numerous scoring chances, but David Krejci, Dennis Seidenberg and Zdeno Chara could not poke the puck past Cam Ward, (27 saves). Interesting Note: The Bruins have been held scoreless following the second period eight time this season. Also, Ward has two shutouts this season, and 18 in his NHL career. (Both notes were provided by the Bruins PR/Media Staff.). Good Tuesday morning to everyone, and welcome into another tremendous edition of the Daily Noontime. 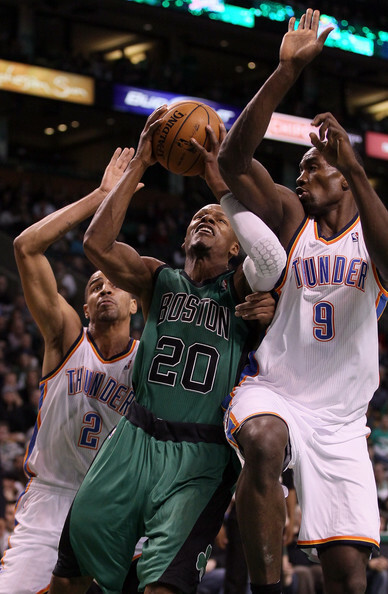 * The Boston Celtics earned their fifth consecutive loss, as well as eighth of the season on Monday when the Oklahoma City Thunder defeated the Green and White, 97-88. Boston will return to the court on Wednesday when they welcome the Toronto Raptors to the Garden. * The Boston Bruins picked up an important win on the road, as they edged out the Florida Panthers in shootouts, 3-2. Patrice Bergeron scored twice, while David Krejci cashed in on the game winner during the shootout period. The Black and Gold will continue their road trip on Tuesday against the Tampa Bay Lightning. * According to reports – The Boston Red Sox have agreed to terms with left-hander Franklin Morales. Also, the Boston Globe confirmed that the club avoided an arbitration hearing with the 25-year-old. * New England Patriots head coach Bill Belichick commended Baltimore Ravens safety Ed Reed on the radio by saying, “He’s got great instincts… he’s a magnet to the ball.” Reed ended Sunday’s game with an interception, as well as sustained a sprain on his ankle, too. Yet, don’t expect the experience veteran to sit out the AFC Championship at Gillette Stadium on Sunday.